Summaries of subscriber email responses are processed into member correspondence records. All responses from a WordFly Campaign are sent back to Centaman (opens, clicks, hard and soft bounces, as well as opt-outs and abuse complaints). WordFly email responses can be seen within member correspondence in Centaman under the section Membership/CRM module and specific Member Records. 2. Search for the specific Member Record you are looking up. 3. 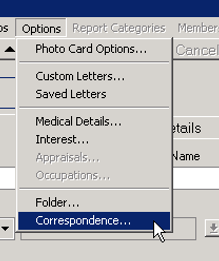 In the Member Record, select Options > Correspondence. This is where you will see WordFly email responses for the subscriber! ‘Date and Time’: This refers to the exact time when the email response happened after the email was sent. ‘Type’: This refers to the correspondence initiated, for WordFly emails the type will be ‘WordFly Email’ or just ‘Email’. ‘Subject’: More information about what was the response is for will be included here if sourceID is mapped during the import process.